Avro Tools | Enkosi Pty. 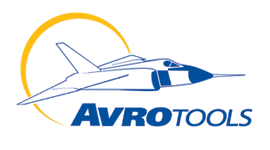 Ltd.
Avro Tools is a leading supplier of high quality pneumatic aircraft tools and accessories. Avro Tools specialises in manufacturing high quality production tools for the Aerospace Industry. Solutions that include Automated one shot drilling and countersinking, Power Feed Countersinking, Hand held integrated drill countersink tools, and a complete range of Microstop Countersinks. A complete range of Air Shut-Off Screwdrivers and Air Shut-Off Angle Nutrunners with attachments available for frangible collar installation or Kaynar style fasteners. Rivet Shavers, Routers and Grinders.